Washington quarterback Kirk Cousins during a Thursday night football game against the New York Giants in Landover, Maryland on Sept. 25. The Giants defeated the Redskins 45-14. If this NFL season’s primetime trend is any indication, Thursday night’s Bills-Dolphins tilt will be another snoozefest under the lights. Paradoxically, the 2014 NFL season has been full of parity — implying a number of closely matched teams — but also full of noncompetitive games in primetime, when you’d expect the league to showcase its most compelling matchups. As a matter of fact, it’s probably been the NFL’s least exciting primetime season of the past eight years (if not more). We can measure this in a couple of ways using the win probability data that ESPN’s Stats & Info Group (SIG) computes for each team on any given play. First, we can look at the (non-)competitiveness of this year’s slate of primetime games — defined as all games beginning after 7 p.m. on the East Coast — by tracking the distance from 50 percent the leading team’s win probability has been on an average play. The closer to 50 percent, the more the game is a de facto toss-up, which equates to more drama. The further away, the less the outcome is in doubt — and, presumably, the less exciting the action. 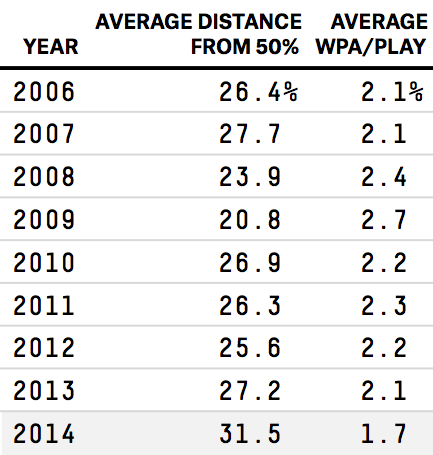 SIG has been computing this metric since the 2006 season, and 2014 thus far has seen the highest average distance from 50 percent on record for primetime games. Prior to 2014, the average moment in a primetime NFL game saw the leading team sit 25.6 percentage points away from the midpoint, but this season that average is 31.5 percentage points. Of course, some games can eventually become exciting even if their average moment isn’t especially close to 50-50. An alternative measure of competitiveness is the average win probability added (WPA) by any given play in a game, which gives more weight to games featuring high-leverage plays, no matter when in the game they occur. An instructive example of the distinction between a game’s average distance from 50 percent and average WPA was the Oct. 26 matchup between the Atlanta Falcons and the Detroit Lions. Since the game was shaping up as an easy Falcons win early — Atlanta led 21-0 at the half — it had a relatively high average distance from 50 percent, suggesting less drama. But the game eventually saw Detroit stage a furious comeback, capped off by a game-winning field goal as time expired; according to average WPA, it was a pretty exciting game, because Detroit had a number of plays in the second half that collected big chunks of WPA. Not all primetime games are created equal, either. Despite the overall decline in primetime excitement this year, “Monday Night Football” (which is broadcast by ESPN, which owns FiveThirtyEight) has seen relatively competitive matchups, with numbers in line with the pre-2014 averages in each of the metrics detailed above. But Thursday night games have been less thrilling, as the table at left shows. And Sunday night has seen the biggest snoozers of all, with an average distance from 50 percent of 35 percentage points and an average WPA of only 1.3 points. Zach Bradshaw, an analytics specialist with ESPN’s Stats and Info Group, contributed analysis.